Treat your dog to BarkBox, the monthly box of toys and treats that’s just as fun for you as it is for your dog. They’ll receive a box of surprises while BarkBox helps support local shelters and rescues in the U.S. and Canada. Get a free month added to any new 3, 6, or 12 month plan. When you sign up, select your dog’s weight (to ensure size-appropriate toys and treats), then your subscription length. Choose from the 3-month plan at $24/box; the 6-month plan at $21/box; or the yearly plan for $19/box. Then, every month around the 15th, a new themed box is delivered with 4-6 treats, toys, and other surprise goodies. When it arrives, prepare for your dog’s obligatory freak out and thank you. While you and your dog discover new toys and treats, BarBox helps support local rescues and shelters across the U.S. and Canada. 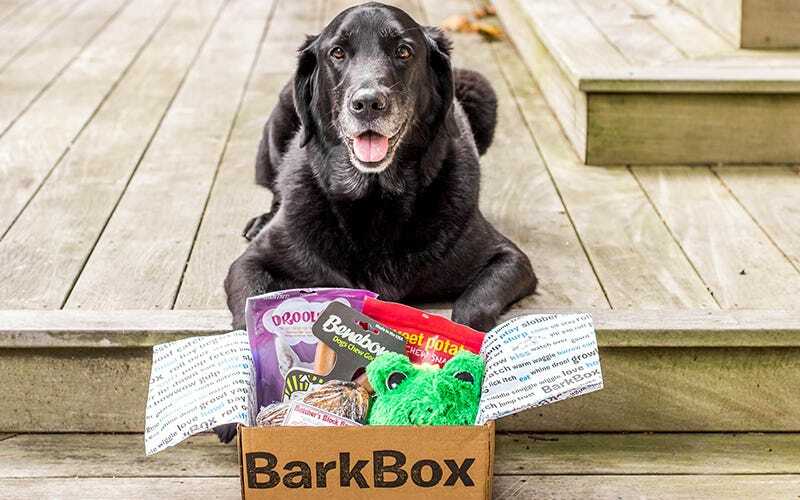 Start your BarkBox subscription now and get a free month added to your plan. The free box is for new customers only, it’s added at the point of checkout, and is not available with one month plans.